We had a very interesting year. Our first puppies started their show careers with very good success. After several Best of Breed Puppy - wins our "Sofie", Linum Venus de Milo, got her first certificate at the end of the year. Her littermate "Adalia", Linum La Gioconda, was shown lightly. Her moment by starlight was in August when she was Best of Breed Puppy and Group-2 Puppy under breed specialist Kirsi Sainio (Of Skyeline). The other littermates "Tatu", Linum Statue of David, and "Kalle", Linum Adam´s Creation, still concentrate on their show training. "Kalle" has sired his first litter in Canada (kennel Skyknight) in December. In Finland we have started to make health examinations to our dogs. Our "Silja", Fin & Est Ch Of Skyeline Alouette, was officially health examined in October: both her knees and eyes are completely healthy. 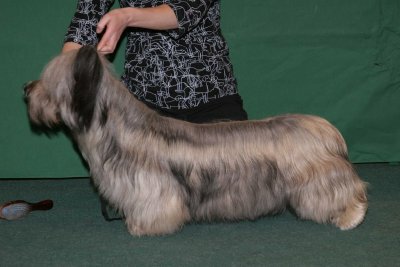 The Skye Terrier Club of Finland will collect these health results and with this information we can breed more healthy and long-lived Skye terriers. "Vilken docka vi har på bordet! Mycket tilltalande huvud. Underbara ögon, toppen topline. Oj vilket kors! Rätt bra knävinkel i ett mycket stabilt bakställ. Underbar kropp för sin ålder. Bra överarm. Riktig, bra skuldra med mycket bra framben. I lovande päls. Synnerligen trevlig helhet! Ett underbart rörelse-schema, kunde vara lite frimodigare." "What a doll we have on the table! Very pleasing head. Wonderful eyes and an impressive topline. Oh what a croup! Correct, good knee angulations in a very stable rear. Wonderful body for her age. Good upper arm. Correct, good shoulder with very good forelegs. In a promising coat. Extremely nice at a whole. Wonderful movement, could be a bit more outgoing." 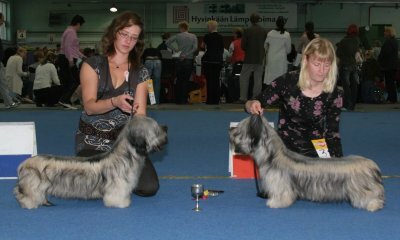 Sisters at the Finnish Terrier Club Main Specialty Show: Linum La Gioconda (left) and Linum Venus de Milo (right). Silja was officially health examined: both her knees and eyes are completely healthy.